Join me for a special Spring edition of my Intuition Card workshop! We’ll reflect on what we want to welcome in this season and create cards to represent the energy and intentions we want to plant and nurture. Intuition cards are a powerful way to listen to your inner voice, set intentions, and get guidance on everyday challenges. You can think of them like tarot, oracle, or angel cards, but with messages and images that are personally meaningful to you. Get inspired! 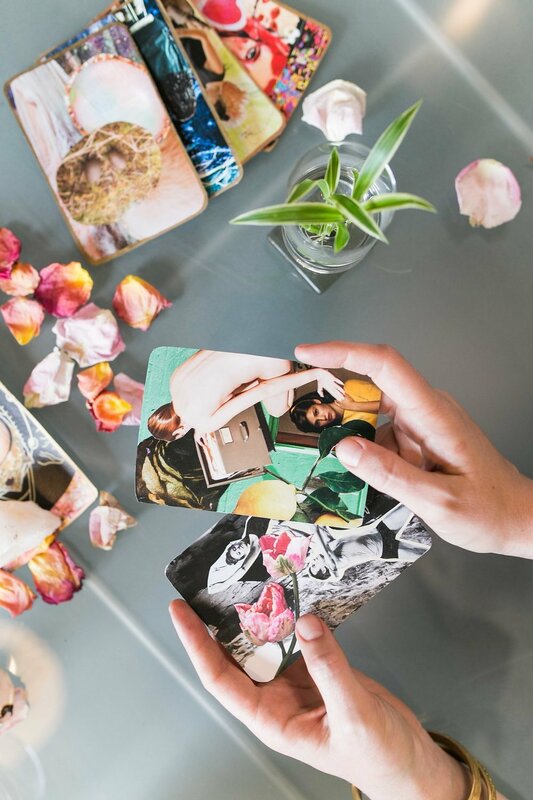 Pull cards from a few different decks to get a sense of what resonates with you. This is also an opportunity to play with some of the decks you’ve been eyeing on Instagram! Your own set of personalized intuition cards: You’ll receive 10 blank cards made of high-quality watercolour paper, and a selection of materials to create with. You can take home any blank cards you don’t use to continue adding to your deck. A worksheet with reflection questions, sample spreads for working with your cards, and a list of materials if you’d like to create more cards at home. Tickets are non-refundable, but can be transferred to a friend. To keep it intimate, space is limited. Buy your ticket soon to hold your spot. Join me for a special New Year’s edition of my Intuition Card workshop to help you integrate the lessons of 2018 and begin to envision what you want to call in for 2019. 2018 Reflections: We’ll spend the first half reflecting on the past year, including the highs and lows, what’s shifted for you, and what lessons and wisdom you embodied. You’ll be guided through a process of creating intuition cards to make that learning tangible using images and words. To close 2018, we’ll write down all the things we want to let go and do a burning ceremony to release them. Envisioning 2019: In the second half of the workshop, we’ll open up to dreaming and connecting to what we want to call in for the new year. You’ll create intuitions card to capture the energy or feeling of what you want more of this year. Create your own set of intuition cards with images and messages that are meaningful to you. Intuition cards are a powerful way to listen to your inner voice, set intentions, and get guidance on everyday challenges. 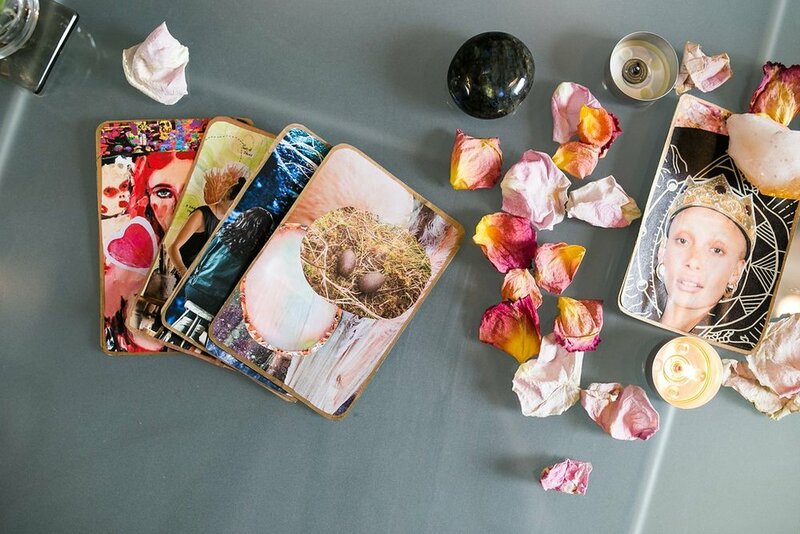 If you’ve been curious about – or already love – intuition / oracle / angel cards, this workshop is an opportunity to deepen your understanding and create your own. Tickets include all materials and light refreshments. Tickets are non-refundable, but can be transferred to a friend. Tickets are $45 +HST and include all materials and light refreshments. To keep it intimate, space is limited. Buy your ticket soon to hold your spot. We are going to get creative AF friends. De-stress through the use of painting, collaging, and writing. No artistic experience required. In this workshop, you'll be guided through a series of creative exercises and group discussion to help you explore your relationship with stress and teach you new tools on how to keep it in check. Get your ticket here. Note that this workshop often sells out, so get your ticket soon! Learn to use intuitive art-making to get a fresh perspective on what's giving you #allthefeels. This workshop includes art prompts (using paint, collage + simple drawing materials), journalling, and discussion. Absolutely no artistic experience or skills are needed! Join me for an afternoon of creative play, connection, and self-care! Bring a creative project that’s been sitting on the shelf or come and play with different materials that will be available. We’ll start with a warm-up exercise to spark your creativity, then have free time to work on whatever you like, in the company of other delightful creative people. $20 +HST covers materials, tea and snacks. $20 covers materials, tea and snacks. Payment by cash at the door or e-transfer in advance. Thank you for signing up for Crafternoon! You'll get an e-mail a few days before with all the details. I look forward to seeing you and getting crafty together! We are going to get creative AF friends. De-stress through the use of paint, colour, and writing. No artistic experience required. 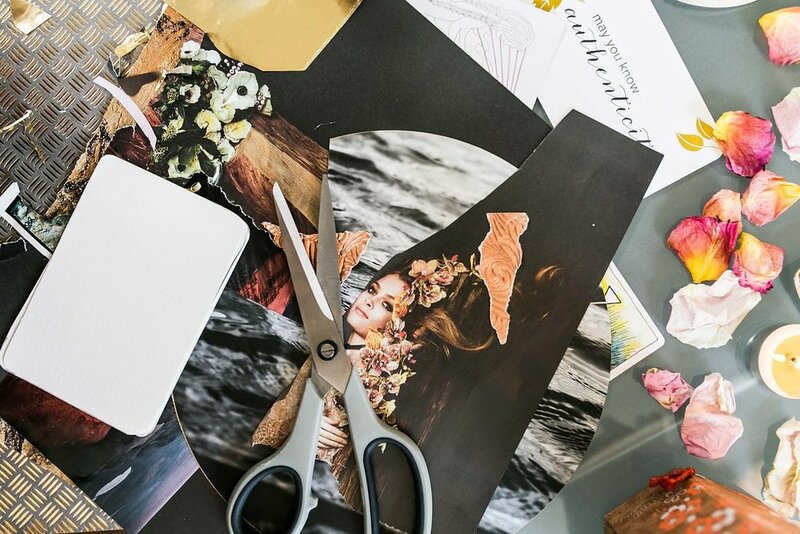 In this workshop we'll be using a mix of painting, collaging, and journaling to help you get out of your own head and re-connect with your inner creative. Join me for an afternoon of creative play, connection, and self-care. This is a monthly gathering, designed to give you the space, materials, and encouragement to spark your creativity. This is not a structured workshop - it is an open space to create and explore. We’ll start with a warm-up exercise and intention setting, then have free time to work on whatever you like, in the company of other delightful + creative people. January's theme is VISION. Materials will be provided to create a vision board, if you'd like - otherwise, bring a project that's been sitting on the shelf, or just play with different materials and have fun. Cost: $20, includes materials, tea and snacks. Pay with cash or e-transfer. If money is tight, PWYC option is available, or bring a skill / material to share in exchange. * All funds raised from this event will go towards LGBT Youth Line. Check out my fundraising page for more information. Spots are limited, send me a note to hold your spot. If you can’t attend this date, send me a note to get on the list for future dates. Suggested donation of $20 covers materials, tea and snacks. Or PWYC / bring a skill, material, or snack to share! Payment by cash at the door or e-transfer in advance. Spots are limited, so RSVP here to hold your spot. If you can’t make this date, let me know if you’re interested in attending a future Crafternoon - I’m thinking of making this a monthly gathering! UPDATE: This event is SOLD OUT. Stay tuned for the next date in January. In this special event for Young Women in Law, I'll lead an experiential session to help you develop stress resiliency skills using breathing, mindfulness, and creativity. No skills or previous experience required! What would it feel like to give yourself permission? Can you imagine what it feel like to cast off self-criticism, self-doubt, and over-thinking? What would be possible if you showed up as your fullest, brightest, boldest self, more of the time? Join Art Therapist Or Har-Gil and coach Barbara Erochina for a day of giving yourself permission to show up for yourself, bravely and honestly. You’ll be part of an intimate group of driven, inspiring women, ready to give themselves the kindness and love they give everyone else. A gift bag with a mini-deck of Be With: Cards for Self-Care and other goodies! All in a gorgeous, light-filled space with a group of other amazing women. **The retreat is open to all who are woman-identified, including trans, cis, and non-binary folks. Bring a friend and save $20 on each ticket! To keep it intimate, space is limited (our last retreat sold out in the first week!) Reserve your spot early by e-mailing or.hargil@gmail.com and sending payment by e-transfer.